Exclusive Beach Colony is located on 11 acres of fabulous beachfront. The ingenious angular living room design transforms every residence into a Corner unit. Wall-to-wall sliding doors and adjoining windows actually wrap around the living room, filling it with light, and revealing the panoramic beauty of the Gulf. The sweeping 300 SF terrace will be a favorite spot for quiet moments and lively gatherings alike. The uniquely situated Master Bath is a world unto itself. The whirlpool bath is surrounded by large, wrap-around windows, which can open to offer both a view and a feel of the hypnotic Gulf. 1497 SF with Tile throughout Living, Dining, Kitchen and Carpet in Bedrooms. Electronics include 55" LCD TV, DVD, Stereo in Living Room, 50" LCD TV, DVD in Master Bedroom and 32" TV, DVD in Guest Bedroom. Efficient and friendly service! Email reminders with directions and rules came just in time! Beautiful condo and furnishings made our stay so nice! Loved the ease of getting to the beach, even from the 17th floor! Everyone was very friendly and helpful over the phone and in person. Tropical storm Gordon hit while we were there and someone came out and assessed the property for damage/water leaks immediately after it was over. They called before the storm before hand and let us know that people would be coming around to close the balcony shutters also. They were very kind and informative and I appreciated that so much! The property was gorgeous, my expectations were exceeded. My children had a wonderful time and thats what its all about :) We go somewhere new every vacation, we never go back to the same place twice but I think we will be making an exception this time! We come down during different times of the year. Every time nature shows us something different. Beautiful & peaceful. You feel worries melt away. Helps to put day to day issues into the proper prospective. We had a wonderful stay. The unit is tastefully decorated with beautiful views. We would love to stay here again! Everyone was nice and friendly. We needed a package delivered from home, and Perdido Realty was kind enough to receive it for us so we could pick it up there. We love Beach Colony. It is our 4th time staying here, and each experience has been excellent. One year I had to put off my stay. While I did not get my deposit back Perdido Realty allowed me to use it towards my next visit. That meant a lot to me! 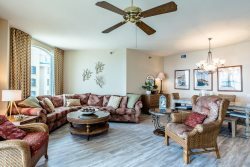 The unit PH2B in Beach Colony west has been beautifully updated and furnished. The mattress in the master is really nice. The jet tub has been replaced with a big soaker tub. The 17TH floor provides a great view! The unit was great! It was a great home away from home. The decor was inviting and very warm feeling, that is not always the case - very classy. Loved the master bath and balcony. We will definitely consider the same unit next time.